We live in a world where real friendship is hard to find. Suspicious of others and insecure about ourselves, we retreat into the safety of our small, self-made worlds. Now more than ever, it's easy to avoid people with whom we disagree or whose life experiences don’t mirror our own. Safe among like-minded peers and digital "friends," we really don’t have to engage with those who can challenge and enhance our limited perspectives. Tragically, even the church can become a place that minimizes diversity and reinforces isolation. Jesus models a much richer vision of friendship. 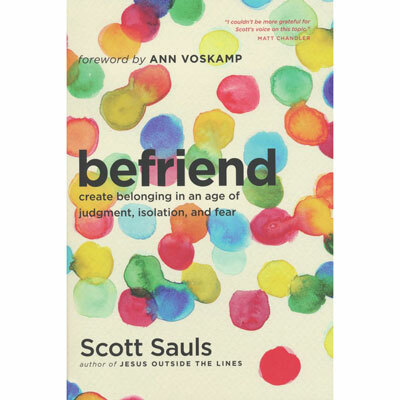 Scott Sauls, pastor and teacher, invites you to see the breadth of Christ's love in this book, Befriend. Join Scott on this journey through twenty-one meditations to inspire actively pursuing God’s love through expanding your circle of friends. Scott Sauls is senior pastor of Christ Presbyterian Church in Nashville. Before this, he served with Tim Keller at New York City's Redeemer Presbyterian Church as a lead and preaching pastor. In addition to his books, Scott's work has been featured in Christianity Today, Relevant Magazine, Qideas, Catalyst, Leadership Magazine, aholyexperience, OnFaith, The Gospel Coalition, Key Life, as well as other publications. Scott can be found on Facebook, and Twitter/Instagram at @scottsauls. He also blogs regularly at scottsauls.com.